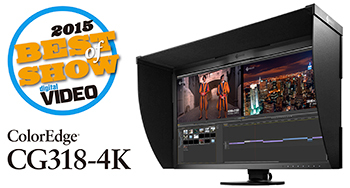 Hakusan, Japan, April 23, 2015 – EIZO Corporation (EIZO) today announced that its ColorEdge CG318-4K monitor received the NewBay Media Best of Show Award, presented at the 2015 NAB Show in Las Vegas by Digital Video magazine. The ColorEdge CG318-4K is a self-calibrating DCI 4K monitor for 2D and 3D CGI, visual effects, compositing, and color grading. It is ideal for both editing and reference work and comes with several preset modes including DCI, EBU, Rec.709, and SMPTE-C. It also integrates 3D LUT data from Imagica for working with Rec. 2020 content. NewBay Media cited the ColorEdge CG318-4K as notable for its design, features, cost efficiency and performance in serving professional users.